I've been busy working on a project again, so I've kind of taken a break from blogging for a while. That project is complete, though there is other work to do. I hope to get back into the swing of things quite quickly. Meanwhile, temperatures here have been in the triple digits with ultra-high humidity. Not exactly great weather to be out and about. But it is good weather for looking at baseball cards. Come to think of it, all weather is good weather for looking at baseball cards. Unless you're doing it outside. I picked up a few cheap packs at Target when I was back in the States in June, including one of these Sticker Collection packs. I had already read that the stickers had been Panini-ized but I'm basically fine with that. I'm glad Panini is (hopefully) getting more printing work even if it's through Topps - they're trying pretty hard to make an entertaining product without using MLB logos. These stickers don't have that problem, since they're "made" by Topps. What was in the package? Wade Boggs? Is he still playing? As always, Topps includes a few retired players in the sticker set. 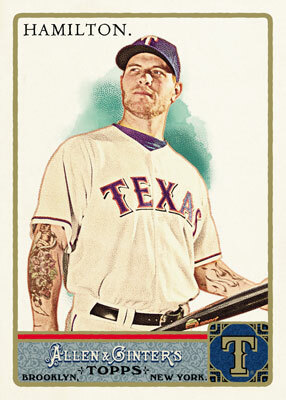 Mascot cards have been growing in popularity, if their inclusion in Topps products is any gauge. They're always in the Opening Day sets and here too. Just please don't turn into a BBM product and put them in every set you make as the checklists for a decade or so! On to the base cards. Kimbrel I know. Iwakuma is Japanese... that's pretty cool. And Johnny Bench is retired, so that's a cool sticker too. I like the design, even with the somewhat-larger borders due to the sticker size. It's a simple but not boring layout. My favorite oddball-Japanese news source sometimes ventures into the world of sports, and of course, Japan's number one sport is baseball. While Americans focus almost exclusively on major league competition, the high school tournaments are pretty close in popularity to Japan's NPB. I've yet to see a high school game here, though I'd really like to. Some of you know that I used to teach high school in the US and I even coached the baseball team (disclaimer: as an assistant coach). So seeing the contrast would be an added bonus to just watching some fun baseball. Now, having been to my fair share of high school and professional baseball games, I've seen plenty of players with unique approaches to getting ready in the batter's box. Of course, there are superstitious ticks like touching different parts of a uniform or refastening batting gloves. We all know the batting stances of Jeff Bagwell and Julio Franco. And beyond that, there are different things players do to stay loose and ready in the box between pitches. I feel compelled to remind you, as you watch this, that high school baseball is a big thing, so the school band performs during the match (in this case, a cover of a classic Queen song of all things), and pretty much every town has its own A/AA-size baseball stadium that the high school teams also use. If I was on the field, after I stopped laughing and peeing my pants from the insanity of the whole thing, I would have done something. As the catcher, some quite unkind words would slip out from behind the mask. If I was the umpire, I would have told the kid to quit delaying the game or he'd be thrown out. As a pitcher, I'd be sure to keep that kid moving by bringing the ball just a bit too far inside. And if I was that player's coach, he'd be on the bench. I originally saw this video on RocketNews24, posted by kenanasq on YouTube. That user has a bunch of videos of high school games and various local stadiums that might interest some fans. And coincidentally, the games/teams that are shown - at least recently - are all in my area. Many of the videos are of the cheers that the band and cheer teams do. Tom was quite courteous to send a nice selection of player collection singles for being the 100th follower of his blog (Angels in Order, of course). Maybe I shouldn't post trade notes, since they create redundancy in my text. It's not a mini Ichiro. I just have cropping issues when it comes to black borders. Mini 2007 Topps cards... would that be a good thing? If the Gwynn looks familiar that's because I accidentally got it in two packages. This is what happens when you don't open your mail for three and a half years, folks. Gwynn and Ryan have been my two favorite players since I was a kid. Speaking of kid, The Kid was another favorite of mine in the 1990s. But then, who could hate a fun-loving superstar with a golden smile? Griffey was definitely the Mickey Mantle or Babe Ruth of my generation, and it would be hard to argue otherwise. It's nice of Topps to give Barry Bonds his own special logo to match his pose on this card. As with yesterday's post, this is quite belated, and I don't even know when this package actually arrived! But flipping through a stack of my favorite players is a great way to spend an afternoon. Thanks a ton, Tom! Do you want to enter a contest? Let me restate the obvious at this point: I got cards from Tom (of Angels In Order) in a trade at some point. I can't find any details about this so I have no idea when it arrived, what I sent (if anything?! - probably some Angels CardGen), or... well... anything. It was only recently that I was able to open the envelope, scan the cards, and enjoy their awesomeness. And I can't find any correspondence about this. But let's see the coolness that was in the envelope! These are one card - a double-sided card for charity. I gather Tom had a few of these, as they've shown up on at least one other blog (hello, PATP!). I'm a Gwynn fan, and PATP is a Rangers fan, so it's only natural that we both would end up with one of these cards. They must be fairly rare though, because I didn't find very much about them out there on the InterWebs. I did find out there are multiple years of them. Now, the majority of the package was from one set. And while he sent me 18 cards from an insert set, that is still less than 1% of the total set's cards. Yup, I'm talking about the Upper Deck 20th Anniversary Retrospective set from 2009. 2500 cards in all. Insanity... and I'm trying to complete it. Well, not aggressively - it's been out for six years and I haven't even got half of the cards yet. But I do pick them up when I find them inexpensively at card shows. My want list for this set is here. O-BA-MA! O-BA-MA! Sorry, I watched a lot of South Park recently. Cool, an award trophy on a card! My, Mozart really had a big head. There were some really big names from this set in the lot: multiple Tigers, Griffey, and Obama especially. It's cool to see Expos logos on cards now that the team has disappeared. So, thank you Tom for pushing me a little closer to the finish line... or at least the first quarter of completion for this set. And tomorrow, I'll have more cards from Tom, received in a completely separate package, for a completely separate reason (I think!). How long ago was this? One of the things I had to scan once I saw it waiting for me in San Francisco was my prize from one of Fuji's awesome contests! My scanner butchered the back of the scan, but perhaps this was the best part! I'd always wanted a Fuji card of my own. So, the prize package was a full set of playing cards featuring the Dallas Cowboys Cheerleaders. Here's the card back and the two (identical) jokers. But you don't want art. You want scantily clad women in strange positions. The set finishes with a story and offer card. How about ordering me up one of those puzzles, posters, and perhaps some of that jewelry? All I have to say about the photos is, wow, the hair. I know it's more than just a little belated, but thanks, Fuji, for the sweet prize!